LSI is outing a bunch of RAID based goodies today from a massive PCIe3 flash array to improvements on their older lines. The common thread here is to increase both the capacity and speed of storage, and LSI does just that. The product grabbing the headlines is the new Nytro WarpDrive BFH8-3200, a product that for once lives up to the hype in it’s name. This is a full height PCIe3 8x flash storage card that has 3.2TB of usable space, 4.0TB of actual flash for those who want the numbers under the hood. 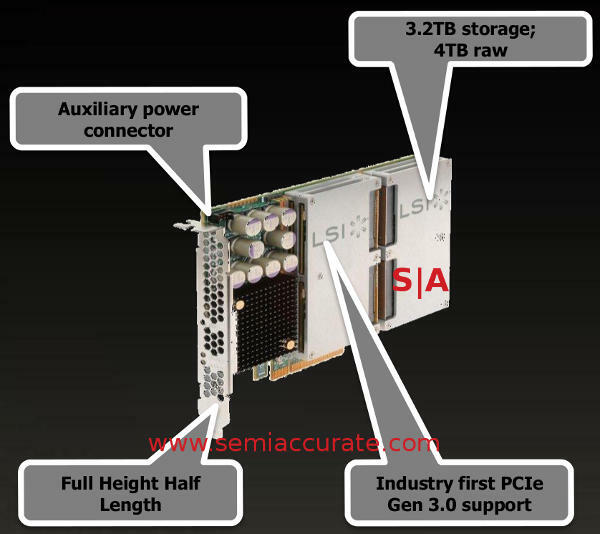 LSI claims a 4.0GBps, not Gbps mind you, sustained throughput for performance, a fairly staggering amount. It boots as a SAS device/RAID card and since it is LSI silicon there should be no driver or firmware headaches with it. The only down side is the cost but what did you expect for 4TB of enterprise grade flash and a PCIe3 RAID controller? If you are interested in dropping your level load times by a few orders of magnitude and have $28,995 burning a hole in your pocket, LSI has the solution for you. If you buy in bulk the price probably drops substantially so kit out your entire cybercafe all at once, not one at a time for the best value. If pure flash storage isn’t in your gaming budget, and for the low low price of $28,995 I can’t understand why it wouldn’t be, rest assured that LSI has some hybrid solutions for you. You might recall the Nytro MegaRAID adapter, basically an LSI 2308 PCIe3 SAS ROC with a couple of SSDs on board for caching. The new cards are technically named the Nytro MegaRAID 8110-4e and 8120-4e that have 200/256GB and 800GB/1TB of flash each. They are the LSI branded versions of the ones with an Intel stamp on them and cost a quite reasonable $2795 and $6995 respectively. While the physical cards are not new, LSI sticker on top of the Intel one aside, the software that LSI brings to the table has a lot of very interesting and useful new tricks. LSI is calling these new functions Nytro Boot, Nytro Elastic Cache, and Nytro Flexible Flash. All three aren’t really that hard to wrap your head around, more things that you might wonder why they weren’t done long ago. The simplest of the three to describe is Nytro Boot, it simply allows a user to use those two SSDs on the card as boot volumes. This means you don’t have to use two of the precious internal drive slots for mirrored boot volumes, the entirety of the server storage can be devoted to useful data and wider RAID arrays. Given how tight most 2U servers are for space, this is not a minor concern in the enterprise space. Because there are two SSDs on the MegaRAID, they can be mirrored for safety if the user so desires. Elastic Cache is a bit more subtle than Boot, and it too uses both drives. The fundamental premise behind the Nytro MegaRAID is that the SSDs are used as boot caches, and most enterprise users will mirror the drives for added safety. That is where Elastic Cache comes in, some smart person at LSI noticed that mirroring read caches is somewhat pointless because the data is already mirrored on the HDs that they are doing the caching for. Instead of mirroring this twice, the space that would have a second flash copy is now used to cache more write data. The net result is a claimed 54% more write cache space in the typical 70%/30% read/write mix scenario. The last one up is called Flexible Cache and it combines the two uses of the card, storage and caching. Behind this feature is something pretty common in mainstream computing, partitioning a drive. The flash storage in the Nytro MegaRAID line has always been user transparent like most caches are, they just work and you don’t realize they are there unless you look for them. With the advent of Nytro Boot they became user accessible. This now opens up a third option, partition the drives to be used partially as a cache and partially as a boot drive at the same time. It isn’t exactly a complex technical feature to wrap your head around but no one else out there seems to be making this rather obvious step.